Video abstract presented by Chawisa Suradom. Patients and methods: This study involved 190 elderly Thais with depressive disorders diagnosed according to the Mini-International Neuropsychiatric Interview (MINI). Anxiety disorders were also diagnosed by the MINI. The 7-item Hamilton Depression Rating Scale (HAMD-7), Montreal Cognitive Assessment, Geriatric Depression Scale (GDS), Core Symptoms Index, Neuroticism Inventory, Perceived Stress Scale and Multidimensional Scale for Perceived Social Support were completed. Descriptive statistics and ORs were used for analysis. Results: Participants included 139 females (73.2%) with a mean age of 68.39±6.74 years. The prevalence of anxiety disorders was 7.4% for generalized anxiety disorder (GAD), 4.7% for panic disorder, 5.3% for agoraphobia, 1.1% for social phobia, 2.1% for obsessive–compulsive disorder and 3.7% for post-traumatic stress disorder, with an overall prevalence of 16.84%. The comorbidity of anxiety disorders was associated with gender (P=0.045), history of depressive disorder (P=0.040), family history of depressive disorder (P=0.004), GDS (P=0.037), HAMD-7 (P=0.001), suicidality (P=0.002) and neuroticism (P=0.003). History of alcohol use was not associated. Conclusion: The prevalence of anxiety in LLD was comparable to other studies, with GAD and agoraphobia being the most prevalent. This study confirmed the role of depression severity and neuroticism in developing comorbid anxiety disorders. Few studies, however, have focused on the Asian population. One such study that included an elderly population in China and India reported a very high prevalence (84%) of subsyndromal anxiety symptoms that were found among the participants with subsyndromal depression symptoms.5 Another significant finding from a 2-year longitudinal community study of older Koreans was that the rate of late-life anxiety in South Korea was similar to those found in Western studies, with some risk factors intersecting.9 However, this longitudinal study still lacks data on the concurrence of anxiety and depression. Population projections predict that the percentage of the elderly population with MDD will increase to 8.2% in 2050, and as mentioned earlier, a large percentage of this number will be assumed to have some degree of anxiety disorder.13 As increasing awareness of depression among the elderly population has led to various studies on late-life depression, evidence of comorbid anxiety disorders and their relationship to depression is still lacking. The Thai elderly population with its increasing numbers and vulnerability due to relatively limited access to psychiatric treatment has yet to be examined for the clinical concerns previously discussed. With this study, we evaluated the magnitude of the problem as reflected by the prevalence of anxiety disorders among older depressed patients and examined the clinical characteristics and associated factors of the comorbidity. Eight hundred and three cases of psychiatric elderly patients were evaluated at four different tertiary care centers across Thailand, namely Maharaj Nakorn Chiang Mai Hospital, Prince of Songkla University Hospital, Songkla Rajanagarindra Psychiatric Hospital and Prasart Neurological Institute, using the Mini-International Neuropsychiatric Interview (MINI) and the Structured Clinical Interview for DSM-IV Diagnosis Axis I disorders (SCID-I/P) to evaluate major Axis I diagnoses according to DSM-IV or ICD-10 criteria. Inclusion criteria of the 803 cases included new cases of patients aged 60 and beyond who attended the psychiatric outpatient unit with one of the following symptoms: sadness, loss of interest, sleep disturbance, poor appetite, memory problems, lack of energy and unexplained medical symptoms. The exclusion criteria included those with medical conditions that interfere with the interview process, illiteracy or language barrier, cognitive impairment, history of schizophrenia, schizoaffective or mania with residual symptoms. In total, diagnoses of depressive disorders were found among 190 participants. Depressive and other psychiatric disorders were diagnosed according to the MINI and SCID-I.14–16 Demographic data, medical and psychiatric history, family psychiatric history and a number of measurements including the 7-item Hamilton Depression Rating Scale (HAMD-7), Montreal Cognitive Assessment, 15-item Geriatric Depression Scale (GDS-15), Core Symptoms Index, Neuroticism Inventory, Perceived Stress Scale and Multidimensional Scale for Perceived Social Support were completed.17–27 The clinician rating measurements, that is, MINI, SCID-I, HAMD-7, and Montreal Cognitive Assessment, were performed by clinicians who were trained to use these measurements before collecting the data. The rest were self-rating scales in Thai language. They are available and had been previously used in research among Thais. Descriptive analysis was used, including percentage for prevalence of comorbid anxiety disorders in late-life depression, mean/SD/percentage for other data, for example, age, gender, education level and mean/SD for rating scale scores. OR, with 95% CI, was used to identify the relationship between comorbid anxiety disorders in late-life depression and sociodemographic and clinical variables. All analyses were performed using IBM SPSS, version 22. All participants provided written informed consent, and the study was conducted in accordance with the Declaration of Helsinki. The study was approved by the independent ethics committee of the Central Research Ethics Committee of Thailand, the ethics committee of Prasat Neurological Institute and the ethics committee of Songkhla Rajanagarindra Psychiatric Hospital. A total of 190 patients with late-life depression were subjects for analysis, a number of which accounted for 23.66% of the initial 803 recruits. As shown in Table 1, participants included 139 females (73.2%) and 51 males (26.8%). Mean age was 68.39 years (SD=6.74), highly suggesting a skewed number of females, a direct result from a higher percentage of female participants in the program. This possibly reflected a higher number of elderly women in the society and a higher prevalence of depressive disorder among women, a well-established fact. 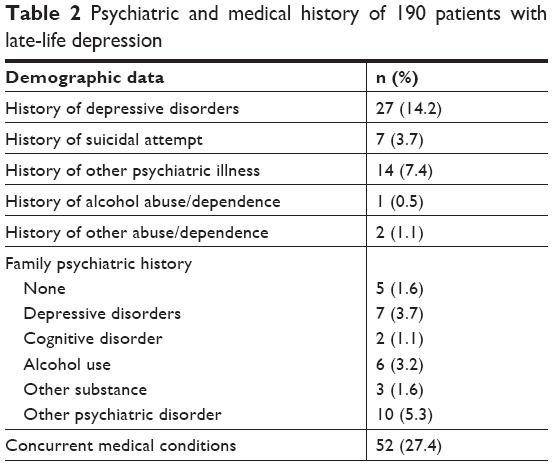 Past history of depressive disorder was investigated, in which 14.2% were found to have had previous episodes and 3.7% had a history of suicidal attempts (Table 2). It needs to be mentioned that we included obsessive–compulsive disorder (OCD) and post-traumatic stress disorder (PTSD) in the anxiety disorder category, according to DSM IV, on which the MINI and SCID-I are based. 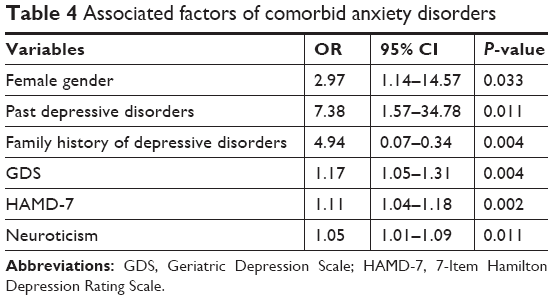 As shown in Table 3, the overall prevalence of comorbid anxiety disorder in late-life depression as found in this study was 16.84% (n=32). The most prevalent disorder was GAD with the prevalence being 7.4% (n=14), while agoraphobia ranked second (5.3%). Others included 4.7% for panic disorder, 3.7% for PTSD, 2.1% for OCD and 1.1% for social phobia which was the least prevalent (n=2). Abbreviations: C, current; GAD, generalized anxiety disorder; MDD, major depressive disorder; OCD, obsessive–compulsive disorder; PTSD, post-traumatic stress disorder; R, recurrent. From the literature review, a number of variables were suspected to be associated with comorbid anxiety disorders in late-life depression and were investigated for their associations. 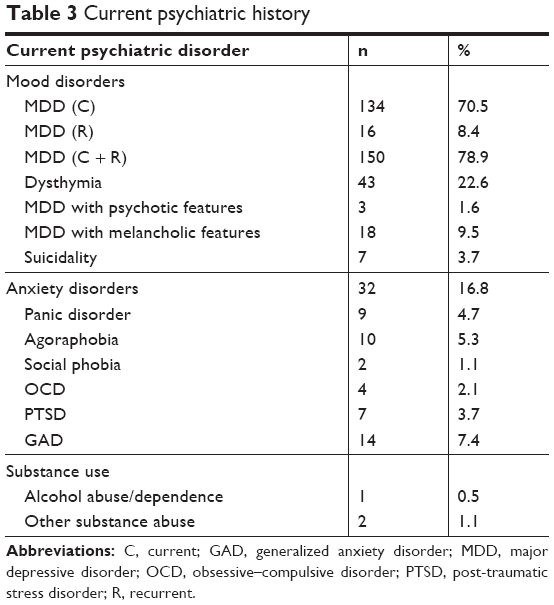 The comorbidity of anxiety disorders was associated with being female, history of depressive disorder, family history of depressive disorders, depression severity as reflected by GDS and HAMD-7 score, and neuroticism, as shown in Table 4. Other variables suspected to be associated with comorbid anxiety disorders were not correlated, including history of alcohol use, level of perceived stress and lack of social support. Abbreviations: GDS, Geriatric Depression Scale; HAMD-7, 7-Item Hamilton Depression Rating Scale. Focusing more on the “state–trait anxiety theory” of personality playing a role in developing comorbid anxiety in late-life depression, neuroticism was found to be a variable that was correlated, confirming the results of related studies.2,10 Notably, the interactions among neuroticism, depression and anxiety among the elderly are complex and need further investigation, with some evidence of anxiety being a moderator for depression. In this study, we suspect the same effect and vice versa. While GDS and HAMD-7 scores reflect depression severity, we may conclude that an association exists between depression severity and comorbid anxiety disorder. Interestingly, previous episodes of depressive disorders may contribute to this association in the sense that multiple episodes may reflect a more severe form of depression and some degree of treatment resistance. Furthermore, this significant history might be a result of a predisposing personality. This would increase the risk of developing both depression and anxiety owing to the persistent nature of personality traits throughout one’s adulthood. This finding is important in terms of application, intensifying the importance of efficient treatment of depression in reducing the risk of developing comorbid anxiety disorders. One interesting aspect was perceived stress not being significantly associated with comorbid anxiety disorders, although some contribution through other variables, for example, history of depressive disorder, neuroticism and so on, was possible. Further investigations may be necessary to confirm this hypothesis. The number of patients with a diagnosis of alcohol use disorder was relatively very low (0.5%), which might stem from the fact that we investigated an elderly population that is less likely to use alcohol and cognitive impairment or severe mental disorders, both related to chronic alcohol drinking, were firstly excluded. Therefore, while making the conclusion of history of alcohol use not having an association with comorbid anxiety disorders, this explanation needs to be considered. The strength of this study includes the fact that we analyzed data from a multicentered study that represented elderly populations in all regions of Thailand, both rural and urban. Moreover, we investigated a significant number of variables previously reported, with appropriate measurements, covering bio-psycho-social factors. This is to date one of the few and most extensive studies on comorbid anxiety disorders in late-life depression in an Asian population. Some limitations were observed in this study. First, we gathered our data among geriatric patients at tertiary care centers, who attended the clinics with psychiatric complaints. This means the demographic data and the possibility of previous treatment might have affected the results. Differences in the nature of the populations might limit the chance to generalize the findings to community settings. Second, with only family history of depressive disorders taken into account, we could not correlate history of other mental disorders, especially anxiety disorder, to the development of current comorbidity, an interesting aspect that needs further investigation. Anxiety disorders are common comorbidities in late-life depression, and the findings of this study confirmed the role of depression severity and neuroticism in developing comorbid anxiety disorders. The results from the present study should increase awareness of diagnosing and treating anxiety disorders that occur in late-life depression in daily clinical practice. Moreover, another implication of this study included the emphasis on efficient treatment of depression to reduce the risk of comorbid anxiety disorders. However, further investigation into the causality of the associations may be necessary to make use of the extensive data we have. In addition, the possibility of directing the limited resources in providing the most practical solution to reduce the risk of comorbid anxiety disorders in late-life depression needs to be explored. This research was funded by the National Research Council of Thailand and conducted between October 2012 and February 2014. Is it correct that your study ended in February 2014 and the DAS program ended in March 2015? This study was part of the Depressive Disorders, Anxiety Disorders, and Suicide Risk and the Associated Factors among Elderly People (DAS) program, which was conducted between October 2012 and March 2015. The authors are grateful to the following contributors in data collection for the DAS Study: Nopporn Tantirangsee, MD, PhD (Songkhla Rajanagarindra Psychiatric Hospital); Thanitha Sirirak, MD and Professor Sawitri Assanangkornchai, MD, PhD (Prince of Songkla University). Lenze EJ, Mulsant BH, Shear MK, et al. Comorbid anxiety disorders in depressed elderly patients. Am J Psychiatry. 2000;157(5):722–728. van der Veen DC, van Zelst WH, Schoevers RA, Comijs HC, Voshaar RC. Comorbid anxiety disorders in late-life depression: results of a cohort study. Int Psychogeriatr. 2015;27(7):1157–1165. Beekman AT, de Beurs E, van Balkom AJ, Deeg DJ, van Dyck R, van Tilburg W. Anxiety and depression in later life: co-occurrence and communality of risk factors. Am J Psychiatry. 2000;157(1):89–95. Jeste ND, Hays JC, Steffens DC. Clinical correlates of anxious depression among elderly patients with depression. J Affect Disord. 2006;90(1):37–41. Prina AM, Ferri CP, Guerra M, Brayne C, Prince M. Co-occurrence of anxiety and depression amongst older adults in low- and middle-income countries: findings from the 10/66 study. Psychol Med. 2011;41(10):2047–2056. Chou KL, Cheung KC. Major depressive disorder in vulnerable groups of older adults, their course and treatment, and psychiatric comorbidity. Depress Anxiety. 2013;30(6):528–537. van der Veen DC, Comijs HC, van Zelst WH, Schoevers RA, Oude Voshaar RC. Defining anxious depression in later life: a scaring heterogeneity in results. Am J Geriatr Psychiatry. 2014;22(11):1375–1378. Lenze EJ, Mulsant BH, Mohlman J, et al. Generalized anxiety disorder in late life: lifetime course and comorbidity with major depressive disorder. Am J Geriatr Psychiatry. 2005;13(1):77–80. Kang HJ, Bae KY, Kim SW, Shin IS, Yoon JS, Kim JM. 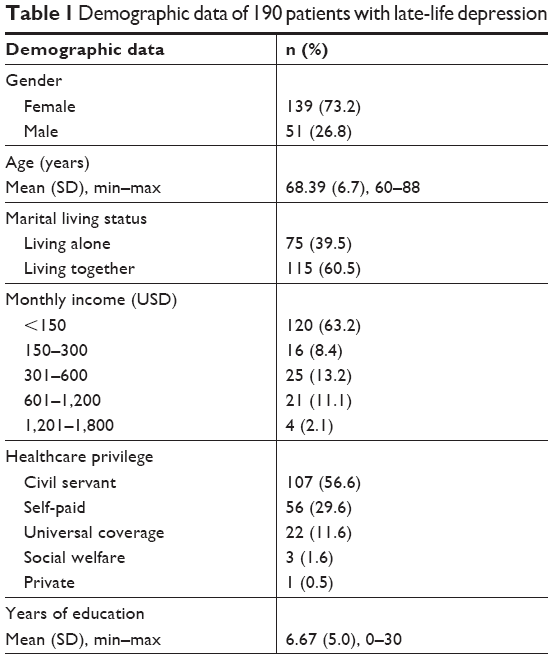 Anxiety symptoms in Korean elderly individuals: a two-year longitudinal community study. Int Psychogeriatr. 2016;28(3):423–433. Steffens DC, Manning KJ, Wu R, Grady JJ, Fortinsky RH, Tennen HA. Methodology and preliminary results from the neurobiology of late-life depression study. Int Psychogeriatr. 2015;27(12):1987–1997. Zhang X, Norton J, Carrière I, Ritchie K, Chaudieu I, Ancelin ML. Generalized anxiety in community-dwelling elderly: prevalence and clinical characteristics. J Affect Disord. 2015;172:24–29. Mulsant BH, Reynolds CF, Shear MK, Sweet RA, Miller M. Comorbid anxiety disorders in late-life depression. Anxiety. 1996;2(5):242–247. García-Peña C, Wagner FA, Sánchez-García S, et al. Late-life depressive symptoms: prediction models of change. J Affect Disord. 2013;150(3):886–894. Sheehan DV, Lecrubier Y, Sheehan KH. The Mini-International Neuropsychiatric Interview (M.I.N.I. ): the development and validation of a structured diagnostic psychiatric interview for DSM-IV and ICD-10. J Clin Psychiatry. 1998;59(Suppl 20):2234–3357. Kittirattanapaiboon P, Khamwongpin M. The Validity of the Mini-International Neuropsychiatric Interview (M.I.N.I)-Thai version. Chiang Mai: I Am Organizer and Advertizing, Ltd; 2004:13–21. First M, Spitzer R, Gibbon M, Williams J. Structured Clinical Interview for DSM-IV-TR Axis I Disorders, Research Version, Patient Edition. (SCID-I/P). New York: Biometrics Research, New York State Psychiatric Institute; 2002. McIntyre RS, Konarski JZ, Mancini DA, et al. Measuring the severity of depression and remission in primary care: validation of the HAMD-7 scale. CMAJ. 2005;173(11):1327–1334. Tangwongchai S, Phanasathit M, Charernboon T. The Validity of Thai version of The Montreal Cognitive Assessment (MoCA-T). Dement Neuropsychol. 2009;3(2):172. Hemrungrojn S. Thai version of Montreal Cognitive Assessment. Available from: www.mocatest.org. Published 2011. Accessed June 10, 2013. Zimet GD, Dahlem NW, Zimet SG, Farley GK. The multidimensional scale of perceived social support. J Pers Assess. 1988;52(1):30–41. Shiekh J, Yesavage J. Geriatric Depression Scale (GDS): recent evidence and development of a shorter version. In: Brink T, ed. Clinical Gerontology: A Guide to Assessment and Intervention. New York: The Haworth Press; 1986. Wongpakaran N, Wongpakaran T. Prevalence of major depressive disorders and suicide in long-term care facilities: a report from northern Thailand. Psychogeriatrics. 2012;12(1):11–17. Wongpakaran N, Wongpakaran T. The Effect of Neuroticism on Academic Performance and Quality of Life in Third-Year Medical Students, Chiang May University. Chiang Mai, Thailand: Department of Medicine, Chiang Mai University; 2012. Wongpakaran N, Wongpakaran T. The Thai version of the PSS-10: an investigation of its psychometric properties. Biopsychosoc Med. 2010;4(1):6. Cohen S, Williamson G. Perceived stress in a probability sample of the United States. In: Spacapan S, Oskamp S, editors. The Social Psychology of Health: Claremont Symposium on Applied Social Psychology. Newbury Park, CA: Sage; 1988:31–67. Devanand DP. Comorbid psychiatric disorders in late life depression. Biol Psychiatry. 2002;52(3):236–242. Regier DA, Narrow WE, Rae DS. The epidemiology of anxiety disorders: the Epidemiologic Catchment Area (ECA) experience. J Psychiatr Res. 1990;24(Suppl 2):3–14. Kendler KS. Major depression and generalised anxiety disorder. Same genes, (partly) different environments-revisited. Br J Psychiatry Suppl. 1996;30:68–75. Hettema JM, Prescott CA, Kendler KS. Genetic and environmental sources of covariation between generalized anxiety disorder and neuroticism. Am J Psychiatry. 2004;161(9):1581–1587.